These days as I have started playing around with videos I am looking at my old folders as well. I remember this bumpy ride from Beshishehar to Sangey really well. It required a strong back, it was that bumpy. 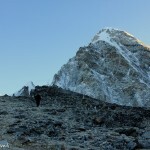 Sangey could be one of the starting points of Annapurna Circuit Trek in Nepal. 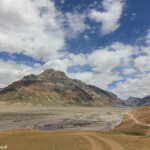 Many people feel the charm of the trek has gone down with a kaccha road now running at least up to Chame. But you can see what is the condition of the road. I am always torn between roads and no roads argument. I tried talking to the locals on the issue of the road. A lady at the lodge in Manang said because of the road the prices of transporting food dropped down. So, it was a win-win situation for everyone. While talking to the people I realized that they resented the fact that helicopters would fly to lift stranded tourists but not for the locals. I could not explain it to them that they flew only for those who had insurance. I wonder why chopper companies could not run an insurance scheme for local people. The local people in the far flung villages, particularly without road connections, found it very difficult to reach a hospital when someone was ill. Transporting an ill person was a great challenge. I could hear then loud and clear on that one. 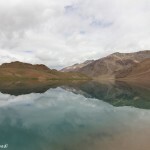 While going for the trek, I took the jeep and the road for granted. While coming back, it was another story. There was heavy rain which washed away the roads, so there was no jeep. Which meant I had to walk more and more. And in the end I realized that sometimes finding a jeep could be almost the best part in a rain soaked trek! Lazy Sunday Photo- Wingpod Purslane Petrified of Street Photography? So am I! Uma 😀 There were countless butterflies too. You would have walked faster compared to the trudging in this jeep! Triund and Ilaka are lovely places. I clicked the most gorgeous rainbow at Triund. oh that is so sad!! Aparna it is such a remote place, at least it had some kind of a road. Ha..ha..It’s part of the do…stay well..! Thank you Murthy I did survive the ride.